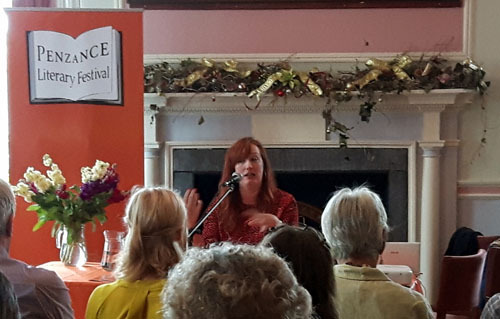 It’s official, the Penzance Literary Festival is the friendliest Litfest in the country…so said one of our contributors. As a festival we don’t have much in the way of funds to splash around and we try to keep our ticket prices accessible … which means we have to pamper our speakers in other ways. The photo here is of our Publishing Day 2016 … a full day dedicated to demystifying the process of getting books in to print with editors from a major publishing house, an independent publisher and an expert in online marketing. In this photo Juliet Pickering of the Blake Friedmann agency gives an eager audience insights on how to approach an agent and spark their interest. The concept of a publishing day was born in the run up to our 2015 festival. The focus of this, our inaugural day, was self-publishing with a range of self-published authors sharing their experiences as well as a fine presentation from Helen Hart of Silverwood Books. Very soon we shall be thinking about our publishing day 2017 so if you have any ideas, or if you are a publisher and would like to contribute, please do get in touch – either directly with me of via the Litfest website, a link to which you will find at the bottom of this page.